Mount Abu is like a breath of fresh air in the parched desert of Rajasthan. The only hill station in Rajasthan, it is located 1,722 metres above sea level and is situated amidst the lush green hills on the highest point of the Aravallis range. It used to be a preferred leisure destination of the ruling royal family back when the Maharajas reigned. A striking feature about Mount Abu is posh houses, which are a blend of British style bungalows and holiday lodges of the royals, sharing space with the rustic abodes of various tribal communities residing in the forests. Possessing great scenic beauty, this quaint hill station is home to lakes, waterfalls and green forests. You can also enjoy blossoming flowers and trees that are indigenous to this region. Mount Abu also houses a sanctuary where you can spot animals such as langur, sambar, wild boar and leopards. Mount Abu is home to many religious monuments, the most famous being the Dilwara temple, Brahmakumari Ashram, Guru Shikhar and the shrines of Jainism. This hill station is not only a peaceful and beauty-laden getaway but also an ideal place for a sacred pilgrimage. Mount Abu is a popular hill station in the Aravalli Range in Sirohi district of Rajasthan state in western India, near the border with Gujarat. The mountain forms a distinct rocky plateau 22 km long by 9 km wide. The highest peak on the mountain is Guru Shikhar at 1,722 m (5,650 ft) above sea level. Mount Abu is well connected with the major cities and towns in Rajasthan via roads and railways. 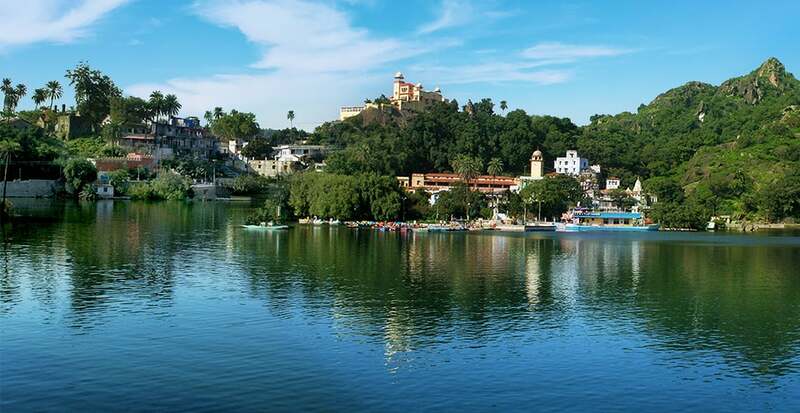 The nearest domestic airport is located 185 kilometers away in the lake town of Udaipur which is connected to Mount Abu via express highways. The Mount Abu railway station is well connected to the other cities and accessible via Jaipur and Delhi. Buses are available from most major cities like Udaipur, Jaipur, Ahmedabad and Baroda along with taxi services. Abu Road Railway Station is located a distance of 28 km from the main city. Located at the heart of Mount Abu, Nakki Lake is the first manmade lake in India. 11,000 meters deep and about a quarter of a mile wide, a trip to Mount Abu is considered incomplete without visiting Nakki Lake. A number of legends surround the origin of the lake, including one that states that Nakki Lake is said to be a sacred lake for the proud Garacia Tribe; but the fact is undeniable that a visit to this place brings you close to the beauty of nature and serenity. As you take a boat ride over the tranquil waters, you can gaze at the mesmerizing hills, the interestingly shaped rocks, and the lush greenery that surrounds the lake. It was the Nakki Lake where Mahatma Gandhi’s ashes were immersed back in 1948 and the Gandhi Ghat was constructed nearby, that’s all the more reason to visit this place. From nature lovers to photographers, the Nakki Lake has clean blue waters and beautiful surroundings that add to the romantic element of the lake, making it a must visit destination for everyone. Guru Shikhar is one of the peaks of the Aravalis, which has the honor of not only being the highest point in Mount Abu, but in the entire Aravali Range. Standing at 1722 meters above sea level, Guru Shikhar is a must visit destination in Mount Abu for the amazing panoramic views it offers of Mount Abu and the surrounding Aravalis, and also for spiritual reasons. Right before you reach the peak, you will find a temple dedicated to Dattatreya, who is believed to be the son that was given to the sage Atri and his wife Anasuya by the holy trinity, Brahma, Vishnu, and Shiva. The peak itself is dedicated to Dattatreya and the temple, dedicated to Lord Vishnu, is an important pilgrimage point for Vaishnavites. Right near the peak is another temple, this one dedicated to Ahilya. On the peak, there is also a huge bell with ‘1141 AD’ inscribed on it. While the original bell had begun to disintegrate and was replaced by a newer bell, its tones are still very captivating and reach a long distance. It is a common practice among visitors to head the peak to try and ring the bell as hard as they can, only to witness the sound-filled serenity in it. The Dilawara Jain Temple in Mount Abu is considered to be one of the most beautiful Jain pilgrimage sites in the entire world. While it looks like a basic temple from the outside, when you enter, you can marvel at the extraordinary architecture and the marvelous stone carvings that grace the temple. The interiors of the temple truly showcase craftsmanship at its best. Built between the 11 th and the 13 th centuries AD, the temples display intricately carved ceilings and pillars that won’t fail to inspire you. Surrounded by lush green hills, the ambiance of serenity and peace at the Dilwara Temples is unparalleled. The temple is divided into 5 sections, namely: 1. Shri Mahaveer Swami Temple: Constructed in 1582, this temple is devoted to Lord Mahaveer, the 24th Tirthankara of Jain's. 2. Shri AdiNath Temple/Vimal Vasahi Temple: Built by Vimal Shah, the Minister of the Solanika ruler of Gujarat in 1031 A.D., this is the oldest temple of all, and is dedicated to Shri Adinath Ji, the first Jain Trithankara. 3. Shri ParshavNath Temple/Khartar Vasahi Temple: Built by the Mandika clan in between 1458-59 A.D., this temple features a tall pinnacle along with four big Mandapas. 4. Shri Rishabdaoji Temple/Peethalhar Temple: Most of the statues here are built using ‘Pittal’ (Brass), and has been built by Bhima Shah, a minister from the Gujarat dynasty. 4. Shri Nemi Nath Ji Temple/Luna Vasahi Temple: Built in 1230 A.D. by two brothers, Tejpal and Vastupal, this temple is dedicated to the 22nd Tirthankara of Jainism - Shri Nemi Nathji. Open every day from 12.00 pm to 5.00 pm, the temple is open to all, and is quite an exquisite sight to behold when in Mount Abu. There is hardly any dearth of wildlife sanctuaries in Rajasthan, and among them is this gem named the Mount Abu Sanctuary. Located across the oldest hill range in the country, the Aravalis, the sanctuary covers a huge area, and is home to a rich variety of wildlife. From the flora, fauna, and the avian species that can be seen here to the breathtaking views and sceneries offered, as well as the eco-tourism opportunities, the sanctuary is definitely a favorite among the many visitors to Mount Abu. The vegetation starts from being sub-tropical thorn forests at the foothill region, and varies up to sub-tropical evergreen forests at higher altitudes. Home to a number of rare and endangered species of animals, the sanctuary houses leopards, jungle cats, sambhar, wolves, Indian civets, hyenas, Indian foxes, jackals, bears, wild boars, common langurs, pangolins, Indian hares, mongoose, hedgehogs, and porcupines, among others. With the presence of over 250 avian species, the sanctuary also makes for an amazing destination for bird watchers. Lying south west of Nakki Lake, Sunset point is one of the most popular viewpoints in Mount Abu. This viewpoint gets thronged by tourists from all around at the time of sunset. Enjoy the site of orange-colored sun setting behind the Aravali Ranges. Serene surrounding and a pleasant climate make the experience even more memorable. Treat your eyes to the picturesque views of the surrounding area including villages and green valleys while the sun is setting down. After enjoying a nice sunset view, you can shop for souvenirs from the shops near the point. Get your hands on trinkets, wooden toys, marble statues, sandalwood idols and other knick-knacks.